F – Art for Art's Sake! 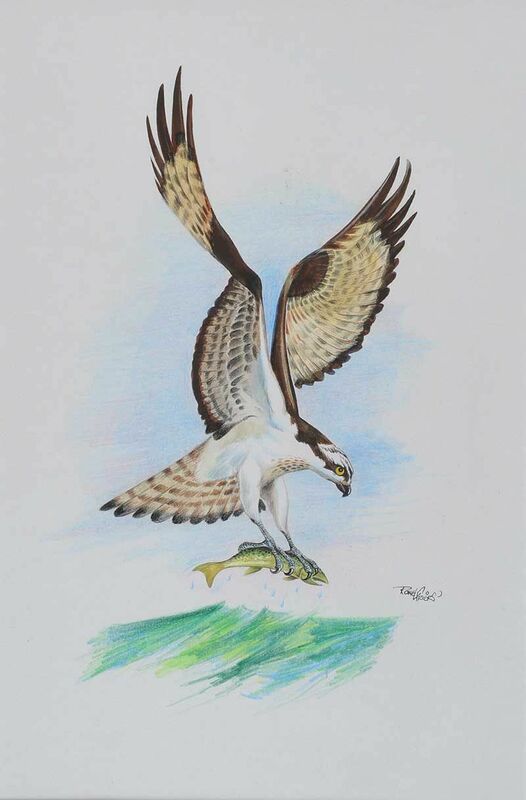 Dudley Farrar was a Northern Irish artist who produced an extensive range of postcards during the 1990s. 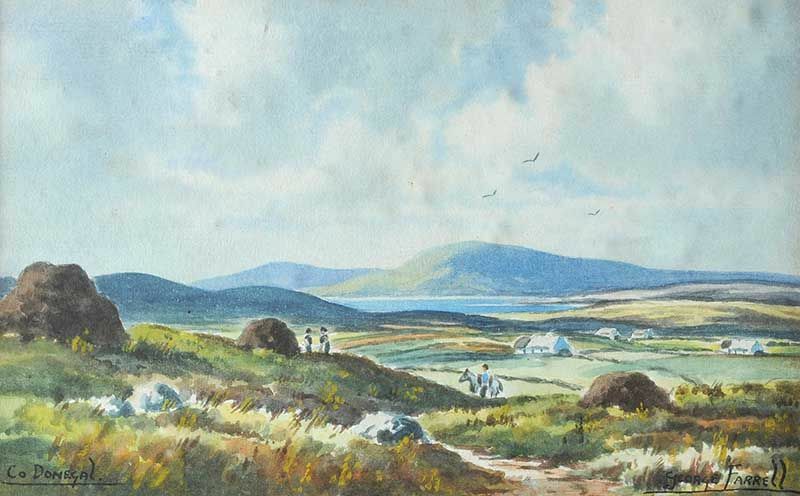 Most were simple cards featuring Irish railway locomotives and carriages against a plain background and belied the fact that he was quite an accomplished watercolour artist. 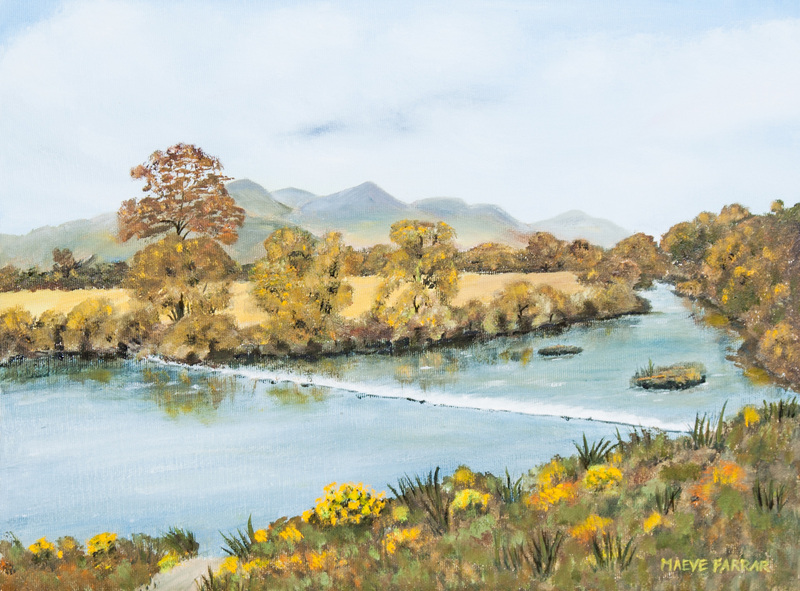 “The River at Kenmare in Autumn” oil (12″ x 16″), sold at O’Reilly’s – 24/10/2018 for €200.00. 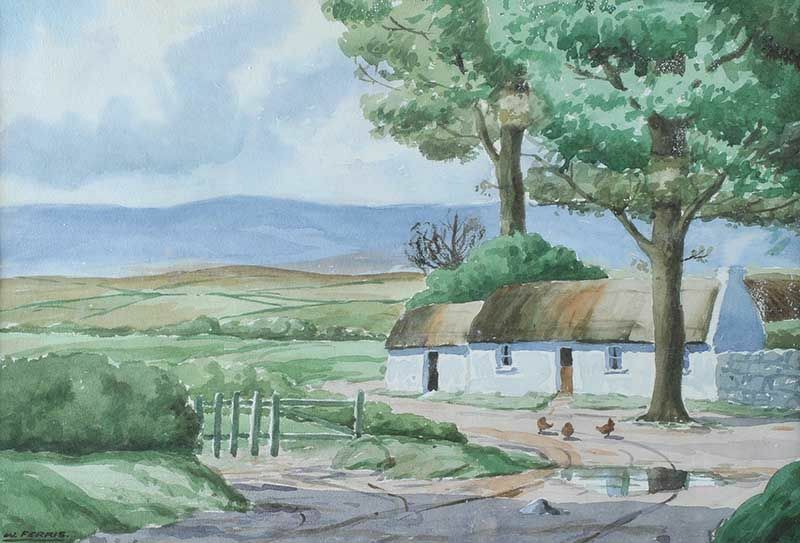 “Thatched Cottages, Donegal” watercolour sold Morgan O’Driscoll 5/2016 – €50.00. 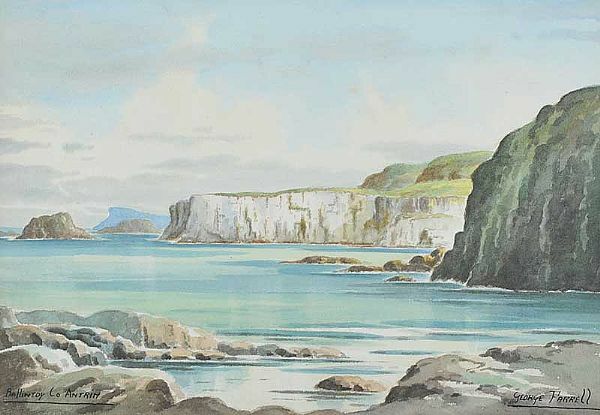 Left to right: “Ballintoy” watercolour drawing (10″ x 14″), sold at Ross’s – 5/10/2016 for £50.00; and “County Donegal” watercolour drawing (6″ x 9″), unsold at Ross’s – 3/5/2017. 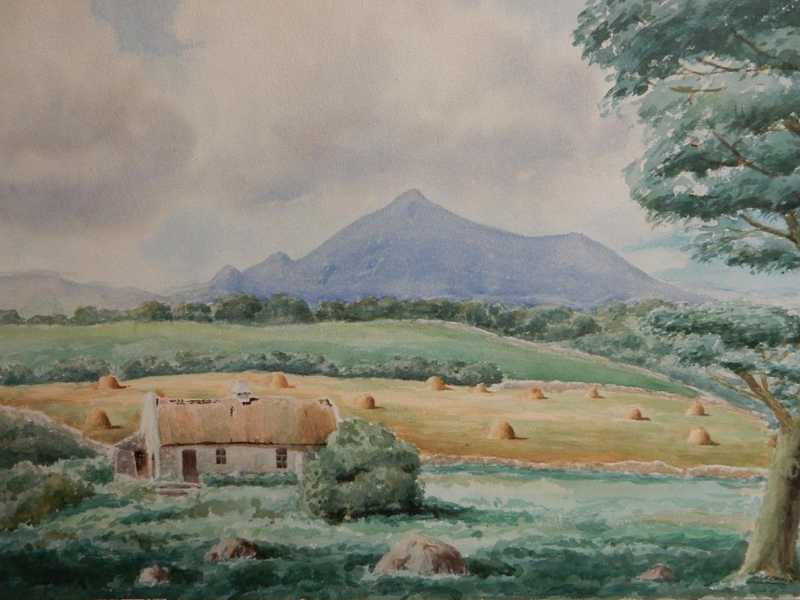 “Evening in the Mournes” watercolour (9.5″ x 16″), sold on eBay – 17/9/2017 for £90.00. 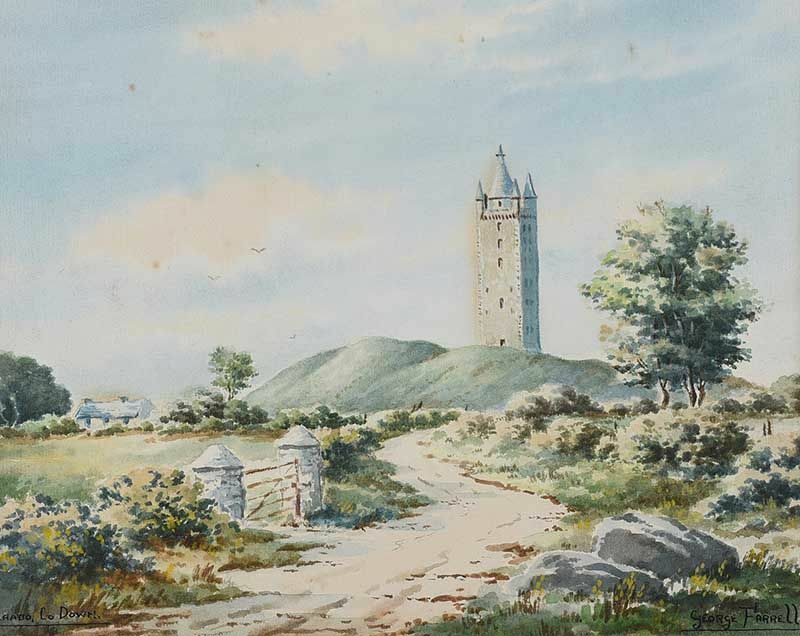 “Scrabo, County Down” watercolour drawing (9″ x 11″) sold at Ross’s – 23/5/2018 for £50.00. 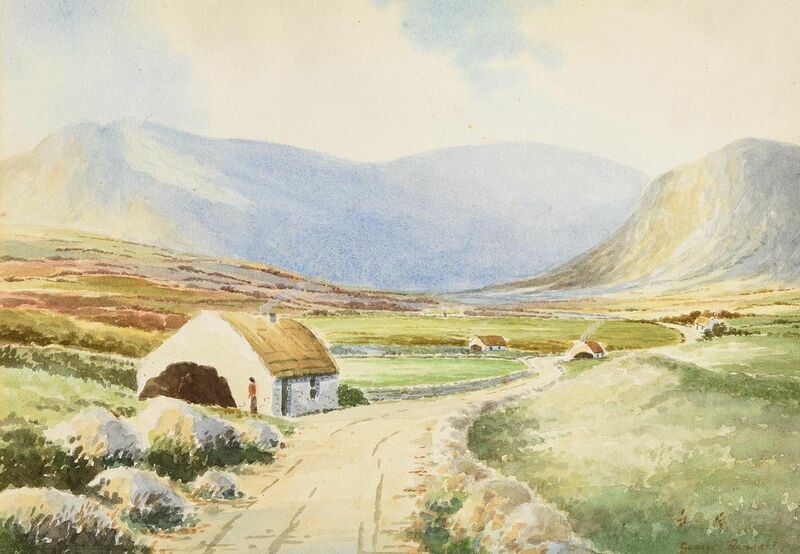 “Gap of Dunloe, Killarney” watercolour drawing (7″ x 14″), sold at Ross’s – 5/9/2018 for £50. 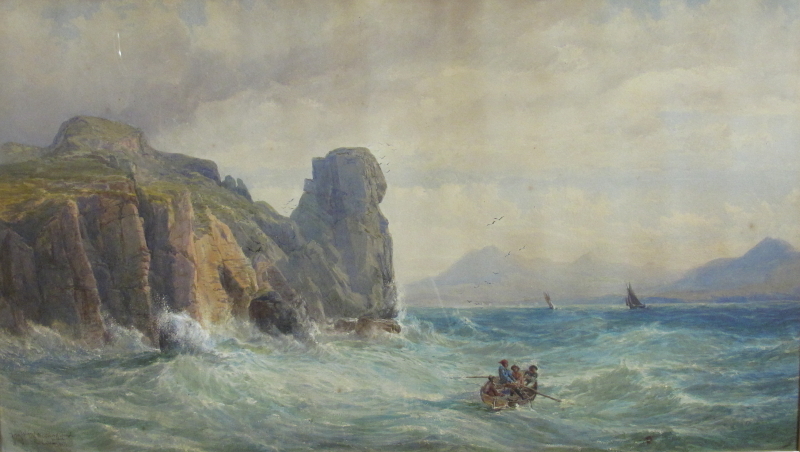 “Tory Island, The Coast of Donegal“. 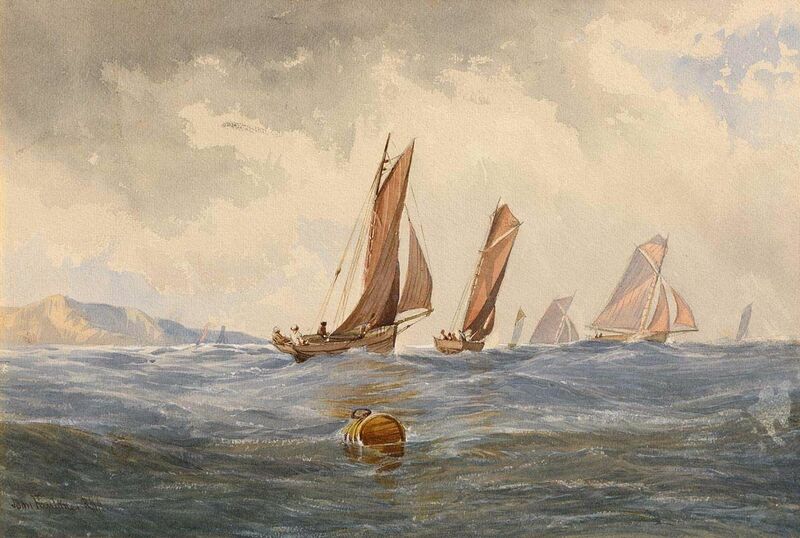 “Sailing off Sherkin Island” watercolour (11″ x 16″) sold at Morgan O’Driscoll’s – 8/8/2017 for €1,000. 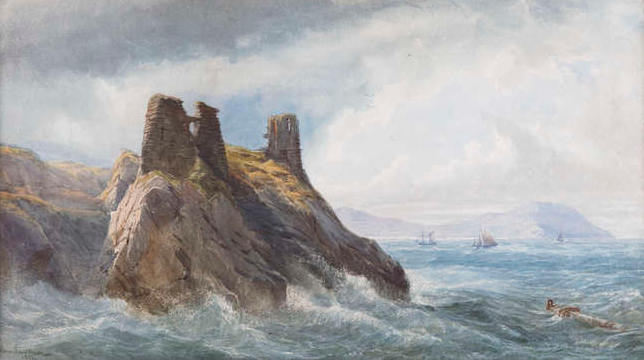 “Black Castle, Co.Wicklow” dated 1877, watercolour (16.5″ x 29.5″), sold at Adam’s – 27/3/2018 for €1,500. 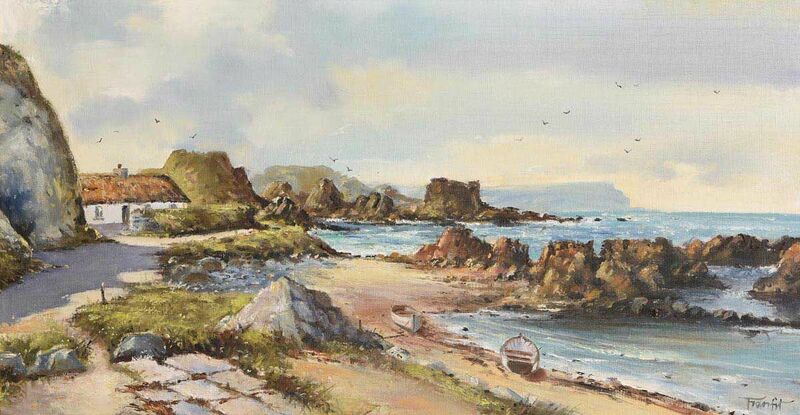 “At Ballycastle” watercolour drawing (7″ x 10″), sold at Ross’s – 7/12/2016 for £40.00. 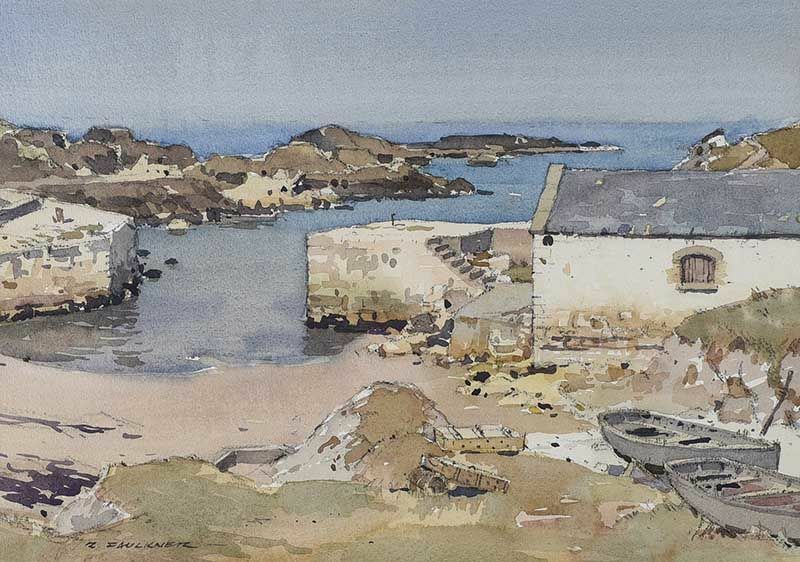 “Ballintoy Harbour, County Antrim” watercolour drawing (10″ x 14″), sold at Ross’s – 13/9/2017 for £300.00. A River meanders through a Forest, oil on board (19″ x 25″), sold at Dawson’s (Maidenhead, England) – 23/9/2017 for £80.00. 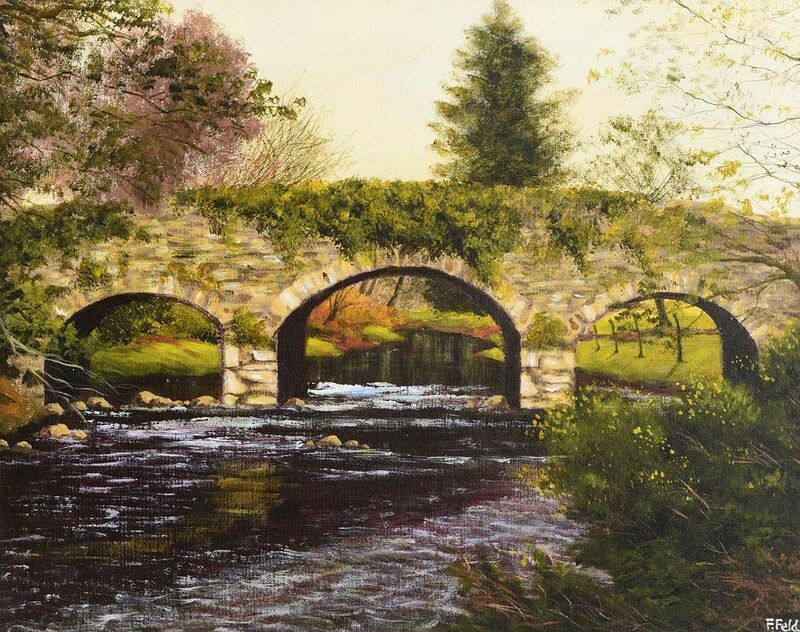 “Bridge Over the River Avonmore, Co.Wicklow” oil on board (15″ x 19″), sold at Morgan O’Driscoll’s – 26/6/2017 for €160.00. 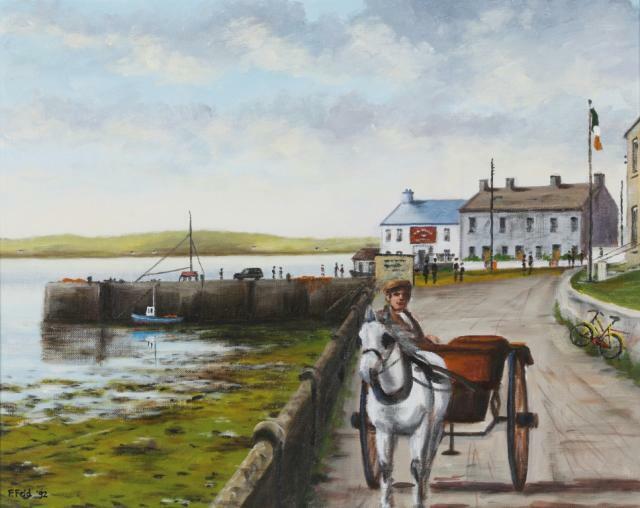 Left to right: “Inishmor, Going to meet the Boat” 1992, oil on board (15.5″ x 19.5″), sold at Dolan’s – 5/8/2013 for €400.00; “Grafton Street” oil on canvas (15.5″ x 19.5″), sold at Dolan’s – 4/11/2012 for €100.00; and “Desmond Castle” oil on canvas board (19.5″ x 23.5″), sold at Morgan O’Driscoll’s – 28/5/2018 for €140.00. 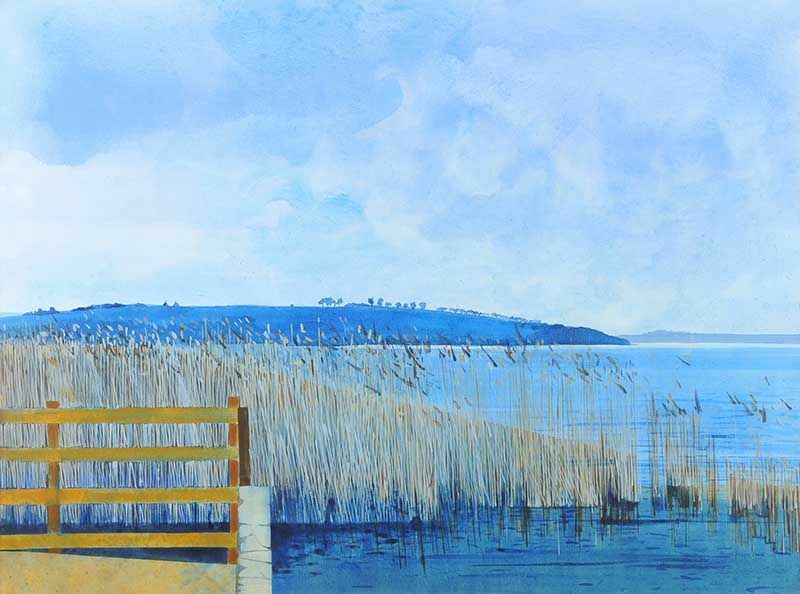 “Reeds, Lough Erne” acrylic and gesso on canvas (30″ x 40″), unsold at Ross’s 7/12/2016. 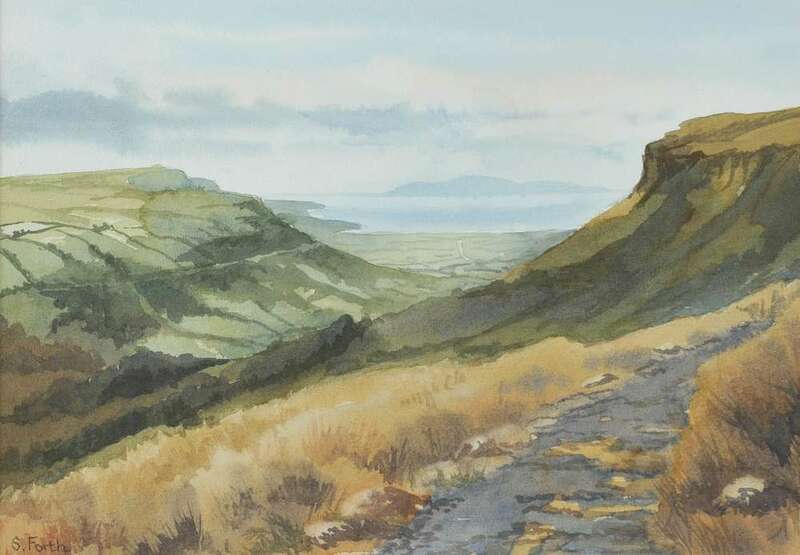 Left to right: “Slieve Binnian Mountain” watercolour (15″ x 21″) sold on eBay – 25/1/2017 for £12.50 ; and “Antrim Coast Road” watercolour drawing (12.5″ x 20.5″) sold at Ross’s – 12/9/2012 for £50.00. 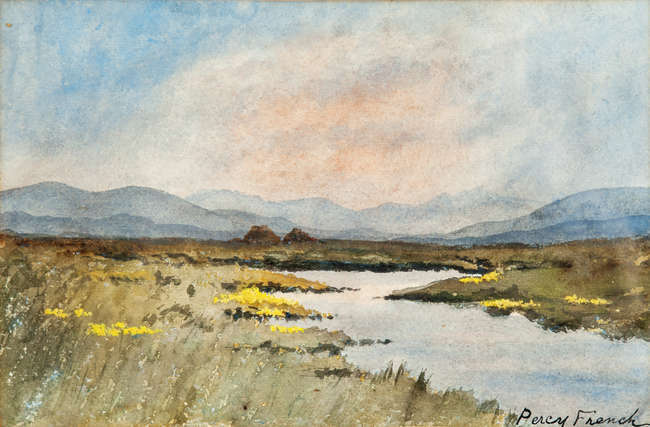 “Near Parkmore, County Antrim” watercolour drawing (10″ x 15″), unsold at Ross’s – 3/5/2017. 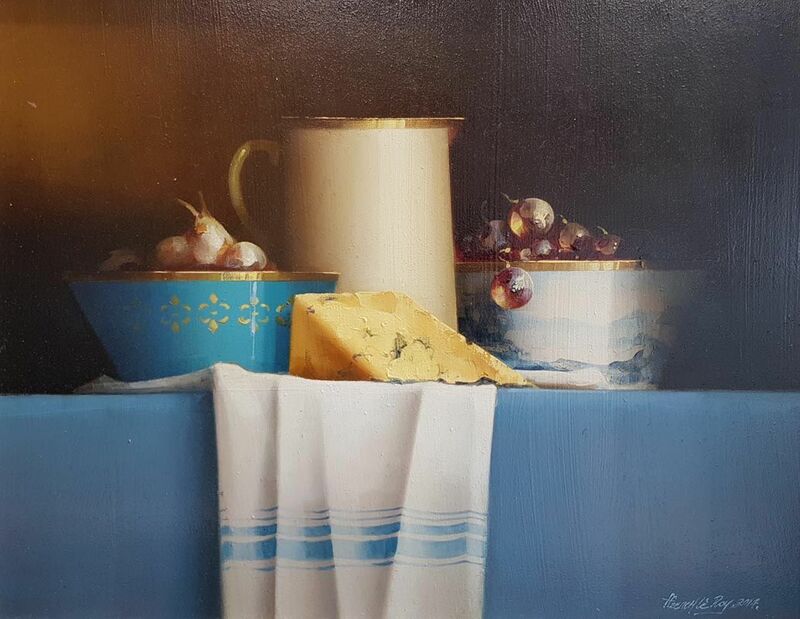 “Still Life With Stilton” oil on board (14.5″ x 18.5″) sold at Morgan O’Driscoll’s – 8/8/2016 for €650.00. Born in Ballymoney, County Antrim. Left to right: “Cottage near the Sea” oil on board (6″ x 8″) sold at Gormley’s for £250.00; and “The Autumn Salmon & Gold Shrimp” oil on board (20″ x 28″), unsold at Ross’s – 9/8/2017. 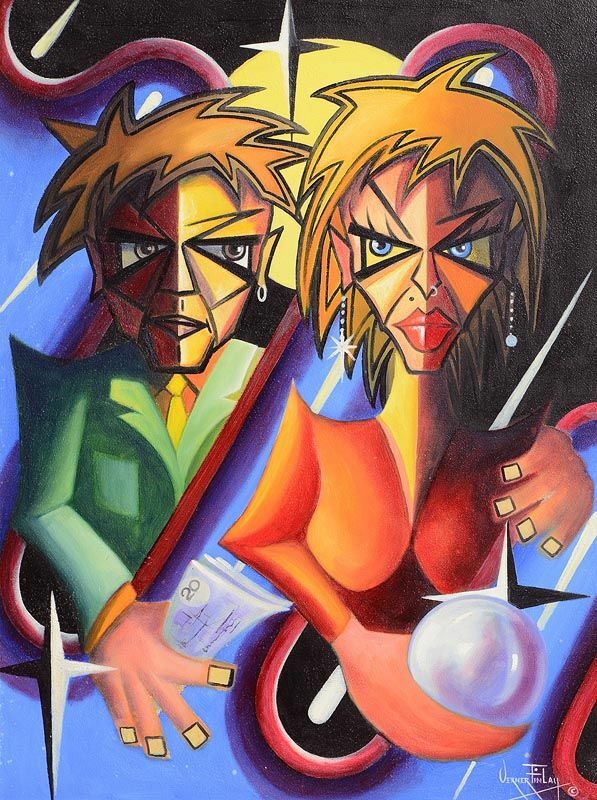 “Paying to the Future” dated 2001, oil on board (24″ x 18″), sold at Morgan O’Driscoll’s – 25/9/2017 for €300.00. 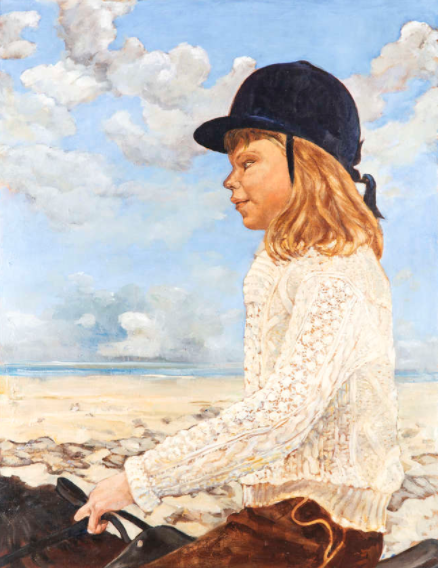 “Riding Out on Killiney Beach” oil on canvas (36″ x 27.5″), unsold at Adam’s – 27/3/2018. 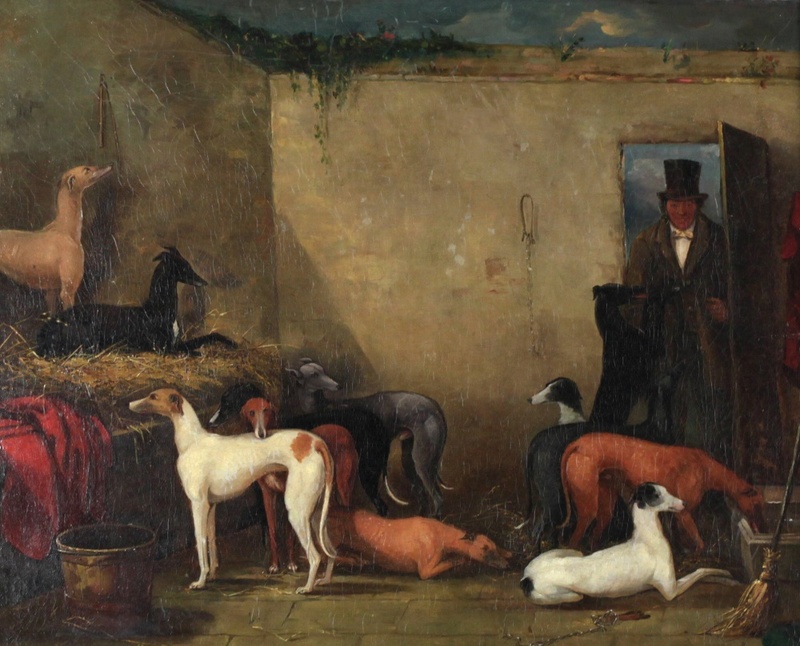 “The Grattan Bellew Coursing Kennel” oil on canvas (20″ x 25″), sold at Fonsie Mealy’s – 10/7/2018 for €3,000. 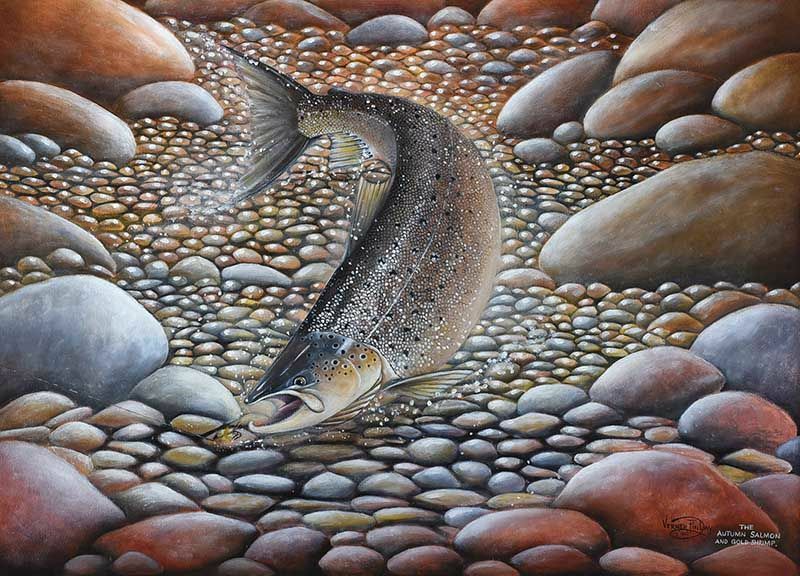 “Digging for Bait” oil on canvas (16″ x 30″) sold at Ross’s – 7/9/2016 for £160.00. 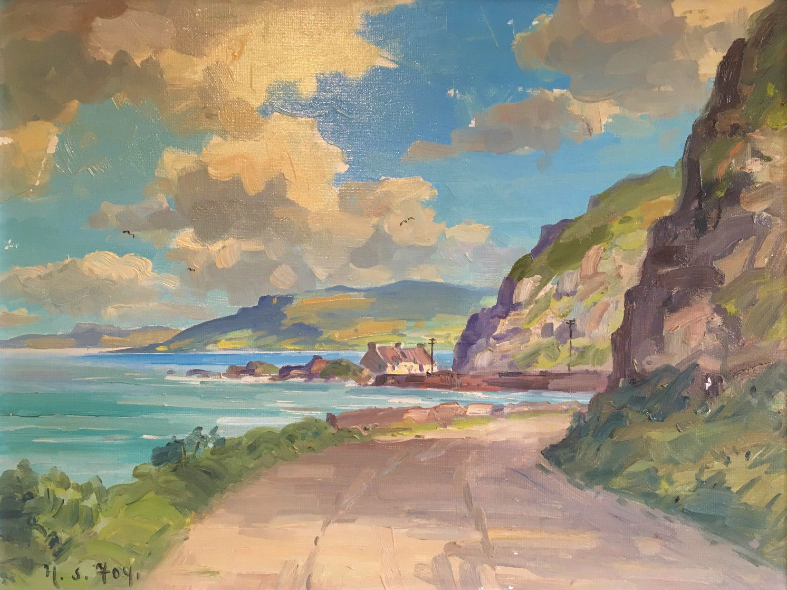 “Ballintoy, Co.Antrim” oil on canvas (16″ x 30″), sold at Morgan O’Driscoll’s – 3/10/2016 for €240.00. 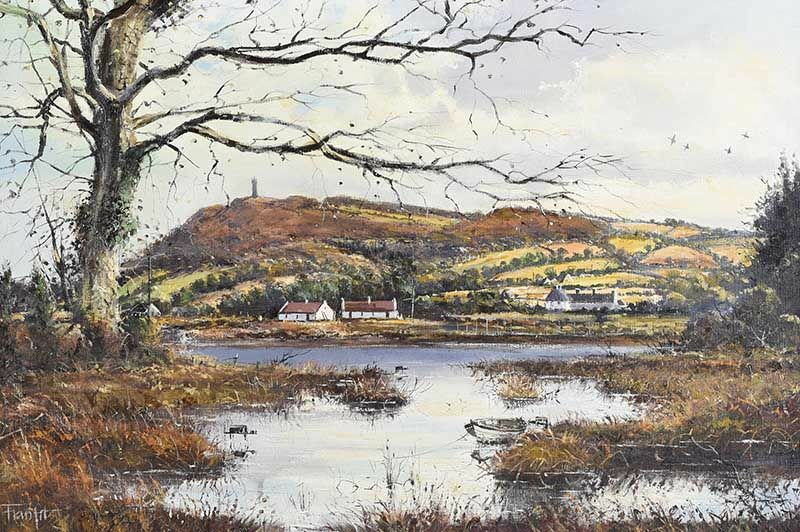 “Scrabo from Kiltong Game Reserve” oil on canvas (20″ x 30″), unsold at Ross’s – 20/6/2018. 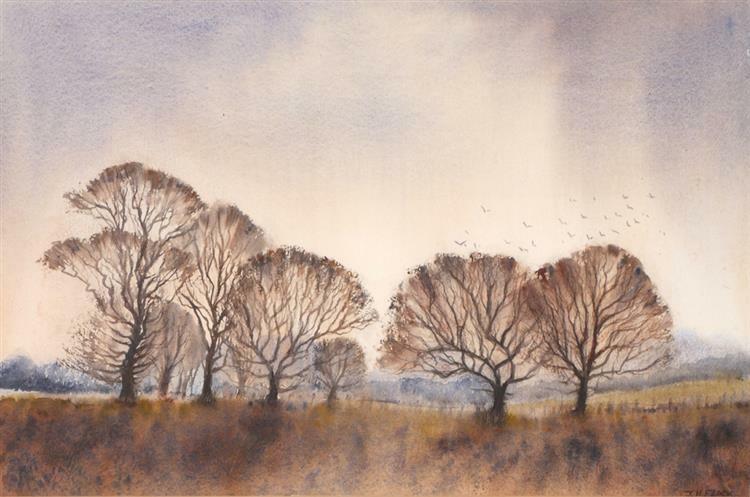 “Oak Trees on Tilled Land” dated 1984, watercolour (14″ x 22″), sold at Whyte’s – 17/7/2017 for €320.00. 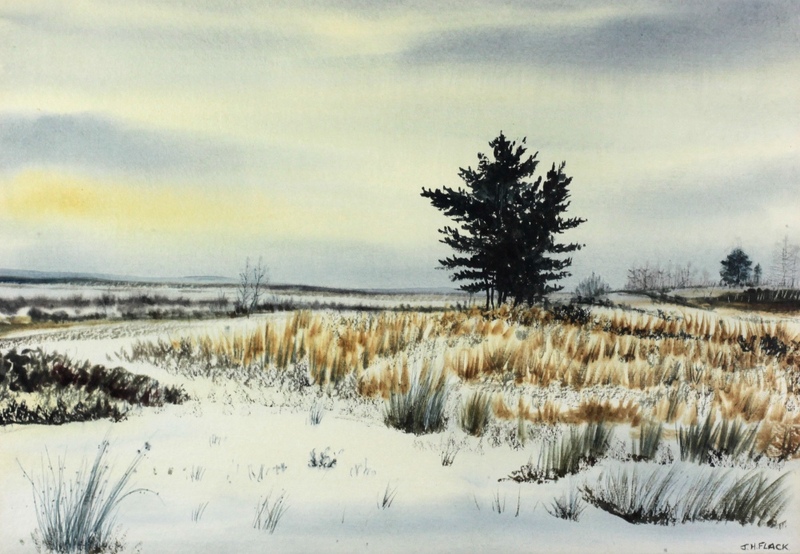 “Winter Bogland with Pine Trees” watercolour (14.5″ x 21″), sold at Fonsie Mealy’s – 10/7/2018 for €110.00. 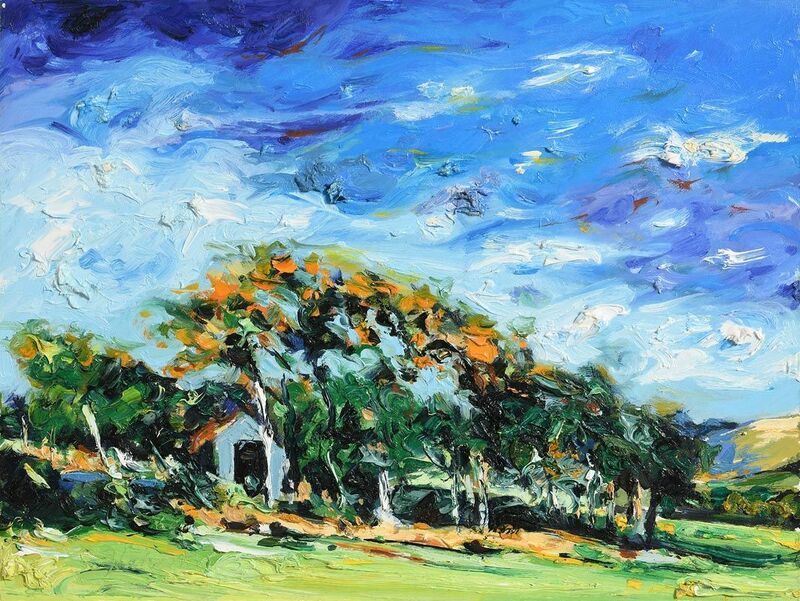 “Cottage in Woodland Grove” oil on board (17.5″ x 24″), sold at Morgan O’Driscoll’s – 24/9/2018 for €950.00. 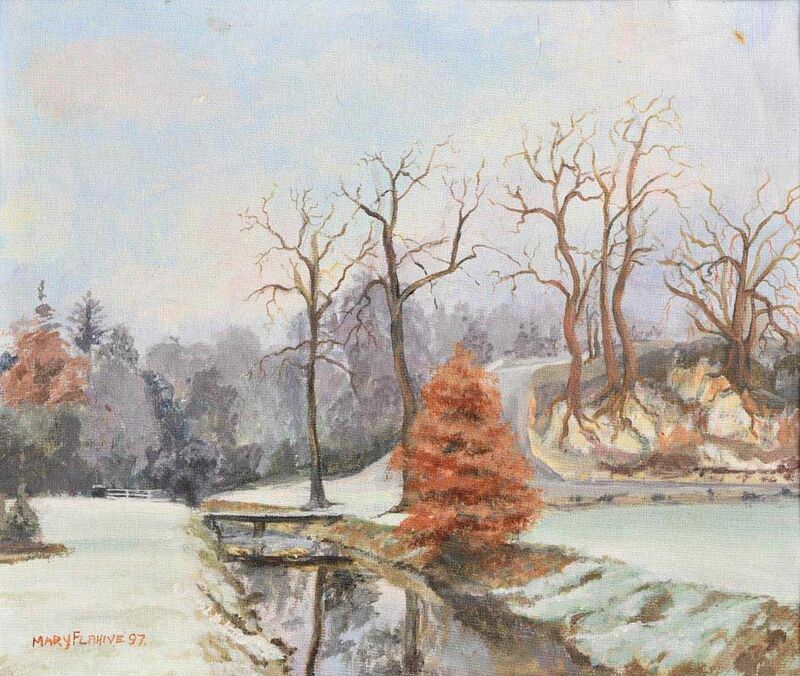 “Park in Winter” dated 1997, oil on canvas board (10″ x 12″), sold at Morgan O’Driscoll’s – 3/10/2016 for €60.00. 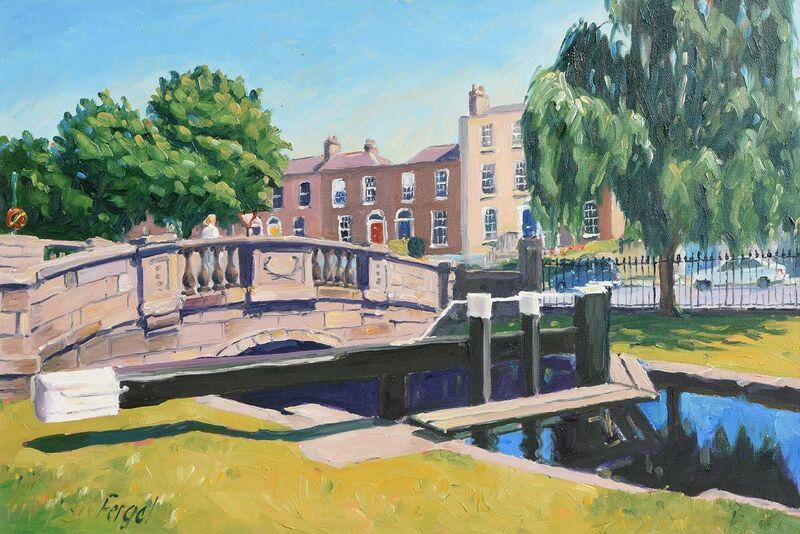 “Huband Bridge, Grand Canal, Dublin” oil on canvas sold at Morgan O’Driscoll 5/2016 – €420.00. 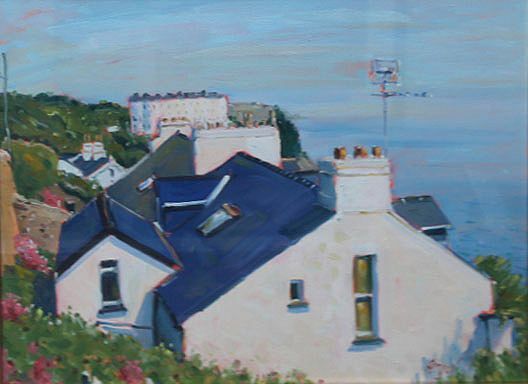 “View towards Sorrento Terrace” oil on board (16″ x 20″), sold at de Vere’s – 10/2/2019 for €220.00. 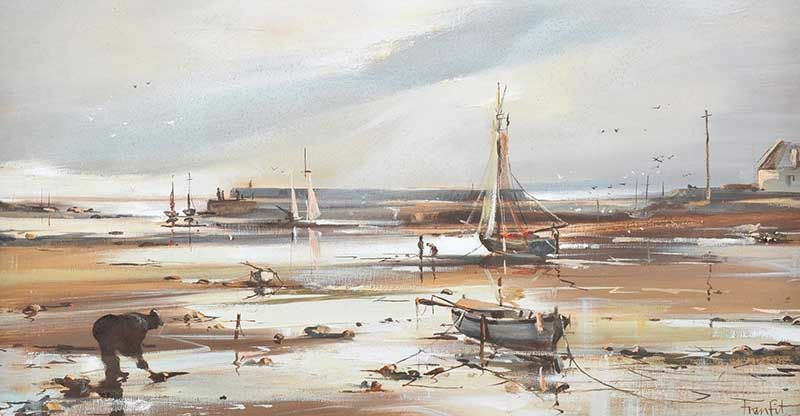 Left to right: “Calm Waters on the Strand, Sandymount, Dublin Bay” watercolour (8.5″ x 13.5″); and “The Broad Highway with Big Sugar Loaf” watercolour (7.5″ x 13.5″), sold with one other at Adam’s 28/11/2011 for €460.00. 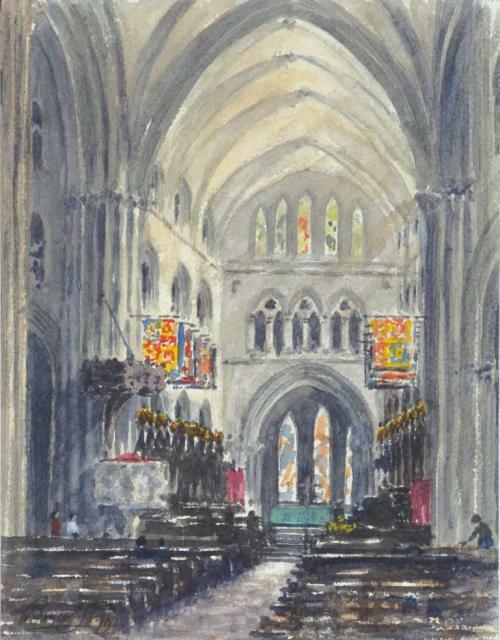 “St.Patrick’s Cathedral, Dublin” watercolour (8.75″ x 6.75″), sold at Dolan’s ‘Clifden Sale’ – 5/8/2013 for €340.00. 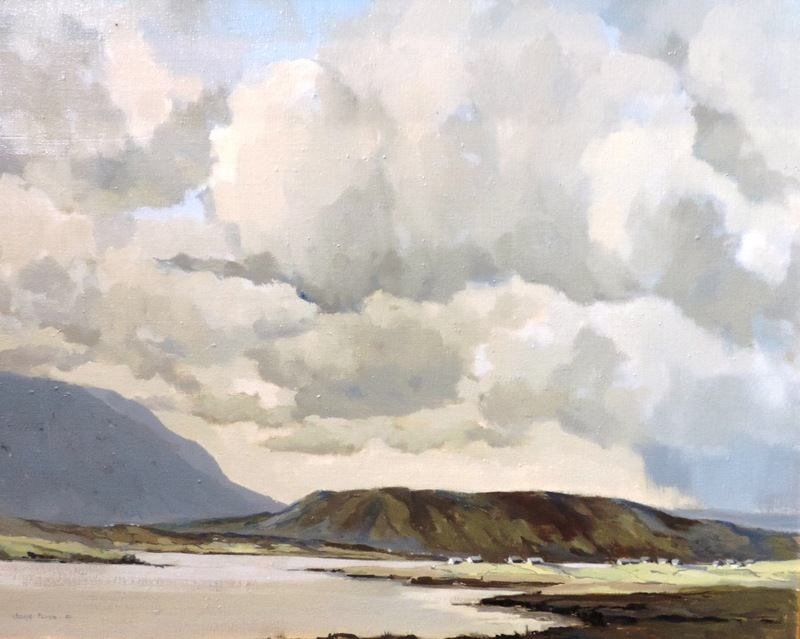 “Achill Island” oil on canvas (14″ x 18″), sold at Fonsie Mealy’s 8/3/2017 for €140.00. 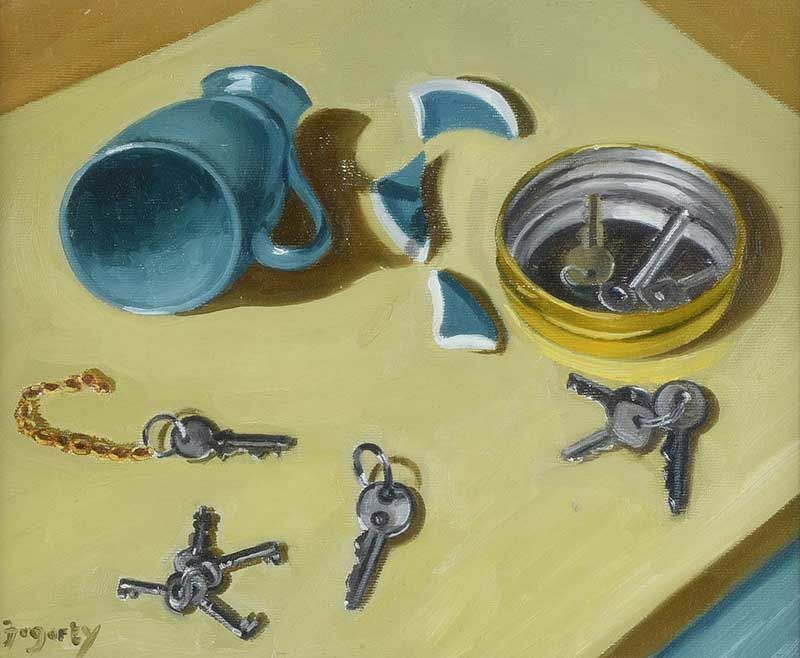 Left to right: “Still Life, Eggs, Spoon, Wine, Jug and Saucepan on a Ledge” oil on board (10″ x 12″), sold at Mealy’s – 30/5/2018 for €100.00; and “Broken Mug” oil on board (10″ x 12″), unsold at Ross’s – 13/2/2019. 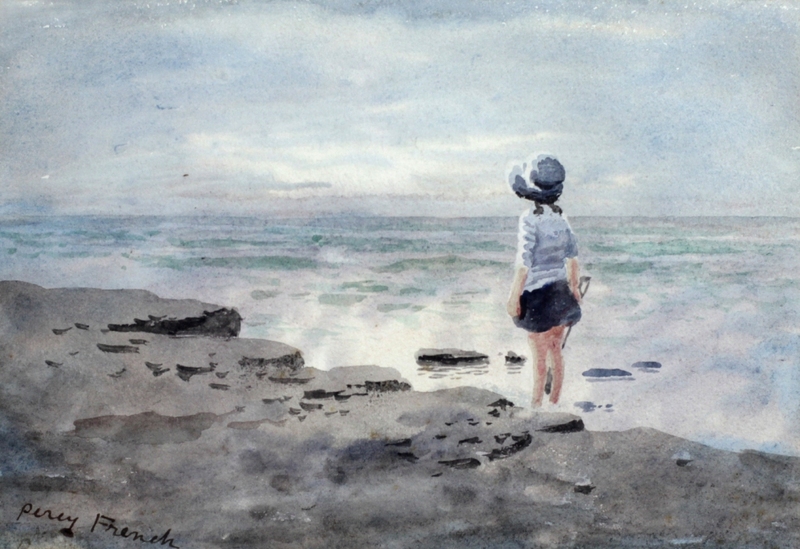 An Irish born Canadian artist. “The Latecomer” oil on canvas. 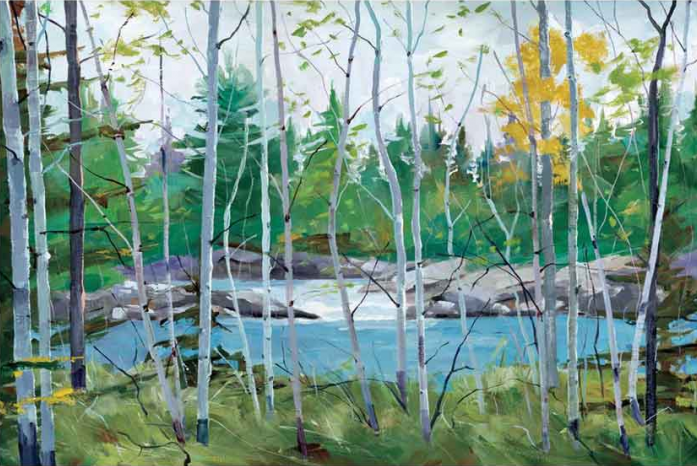 “Oxtounge Rapids” oil on canvas. “Glenariff Valley” watercolour drawing (9″ x 13″). 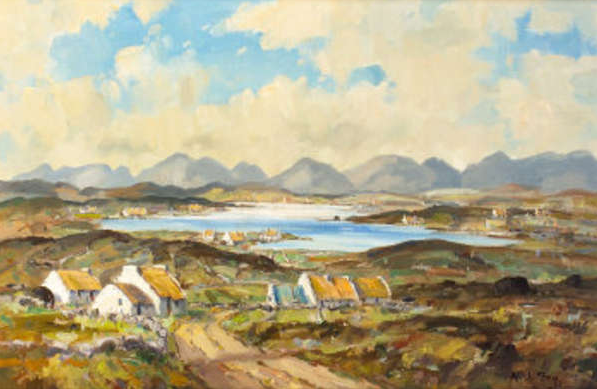 “Maghera, County Down” dated 1928, oil on canvas (17″ x 20″), sold at Fonsie Mealy’s – 8/3/2017 for €650.00. 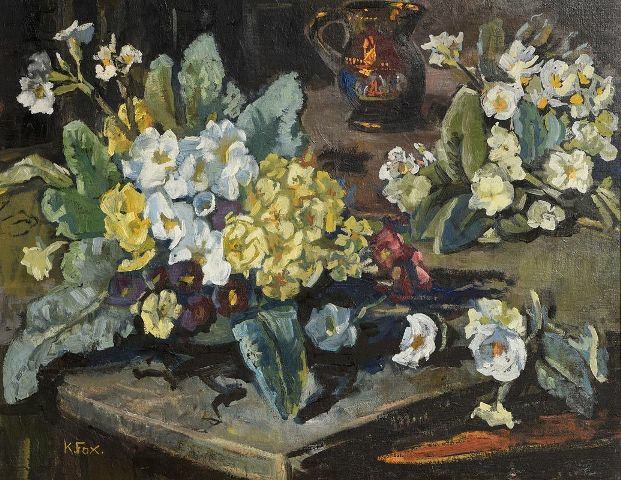 Bob Fox is a self-taught Irish artist, working mainly in oils and watercolour. 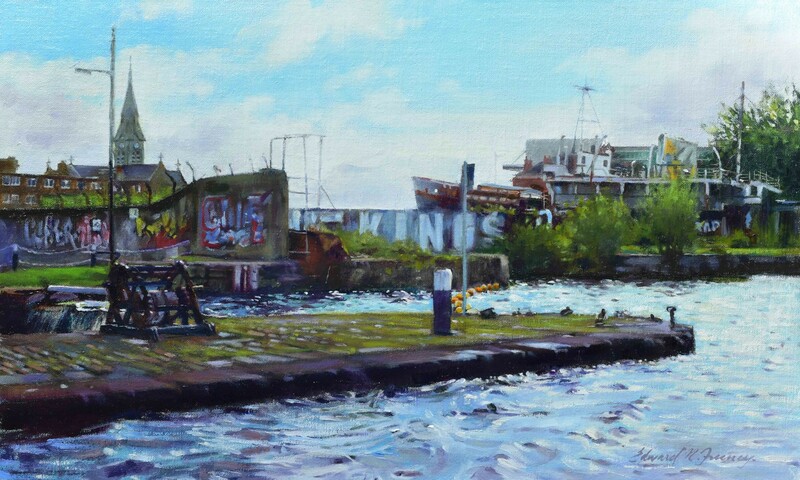 “Docklands, Belfast” acrylic on board (16″ x 11″), unsold at Ross’s – 9/8/2017. 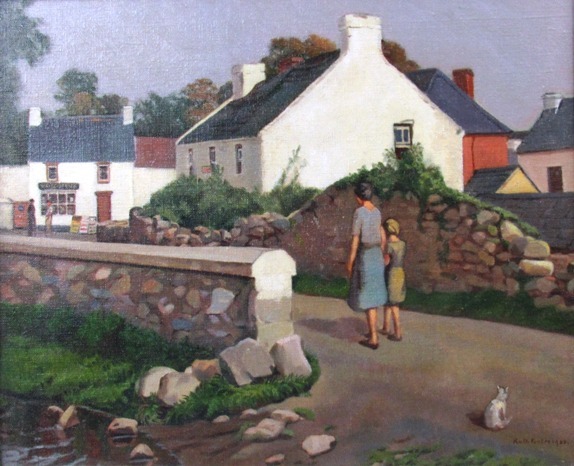 Originally from Tullamore, Co. Offaly, the artist now lives and works in Belfast. Painting since a very young age, he graduated from GMIT (Galway), with an Honours degree in Fine Art in 2011 and the University of Ulster, Belfast, with an MFA (Masters in Fine Art) in 2013. 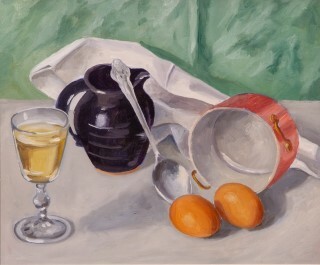 “Still Life on Tabletop” oil on canvas (21″ x 27″), unsold at Morgan O’Driscoll’s – 24/10/2016. 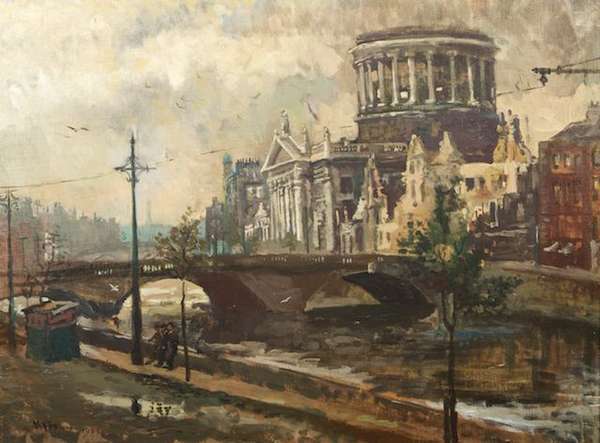 “Ruins of the Four Courts” dated 1922, oil on canvas (20″ x 27″), sold at Adam’s – 1/10/2014 for €8,000. “The Twelve Pins” oil on canvas, (16″ x 23″), sold at James Adams – 11/10/2006 for €700.00. 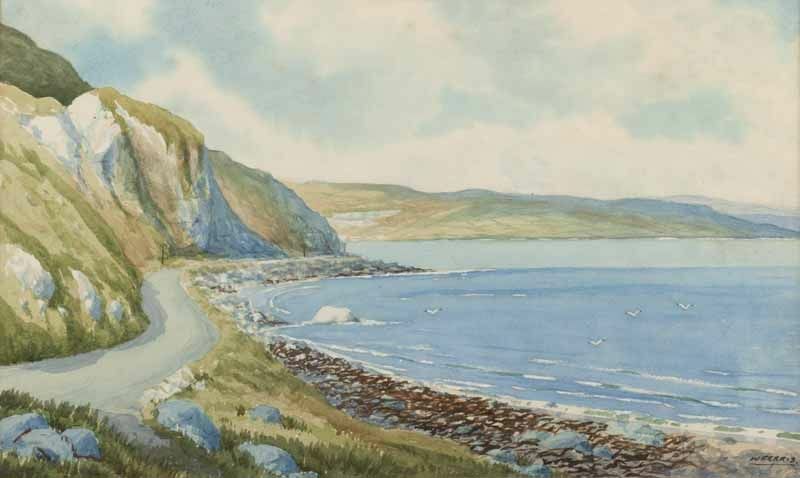 “Garron Point, Antrim Coast Road” oil on board (12″ x 20″). Landscape and still life artist. 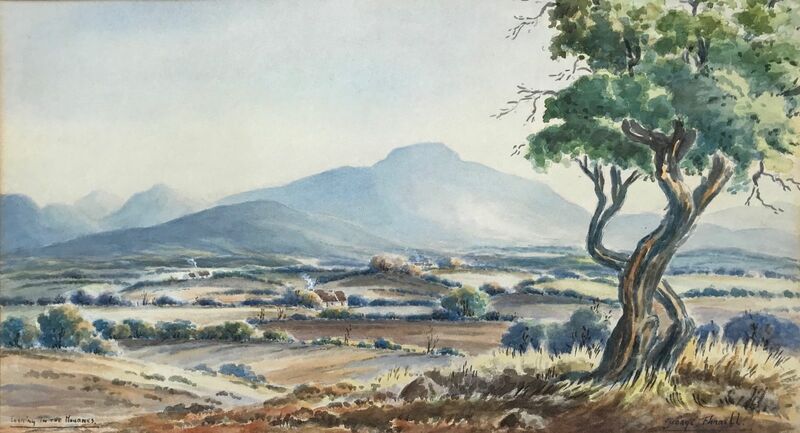 Frazer was born in Dromore, County Down, enrolled in the Dublin Society in 1812 and exhibited at the Royal Hibernian Academy from 1826 through 1864. Granted membership at the RHA in 1837 he would be a professor there from 1839 to 1853. 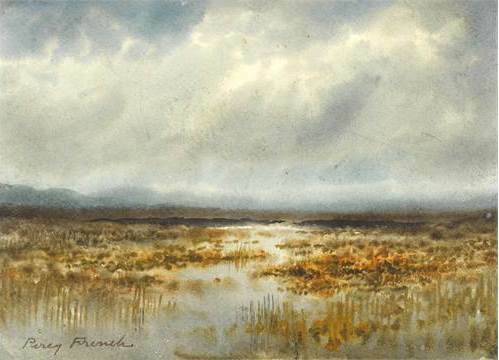 Frazer was also President of the Association of Artists, which was founded in Belfast in 1836. 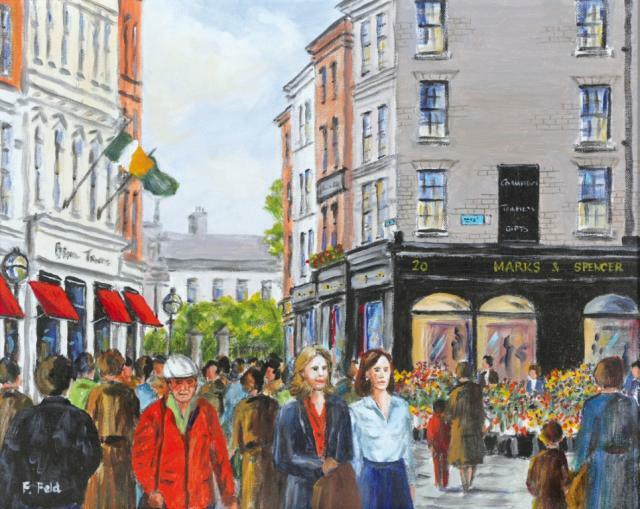 “Dublin Scene” oil (12″ x 20″) – exhibited at the Dublin Painting & Sketching Club 2018 Exhibition. 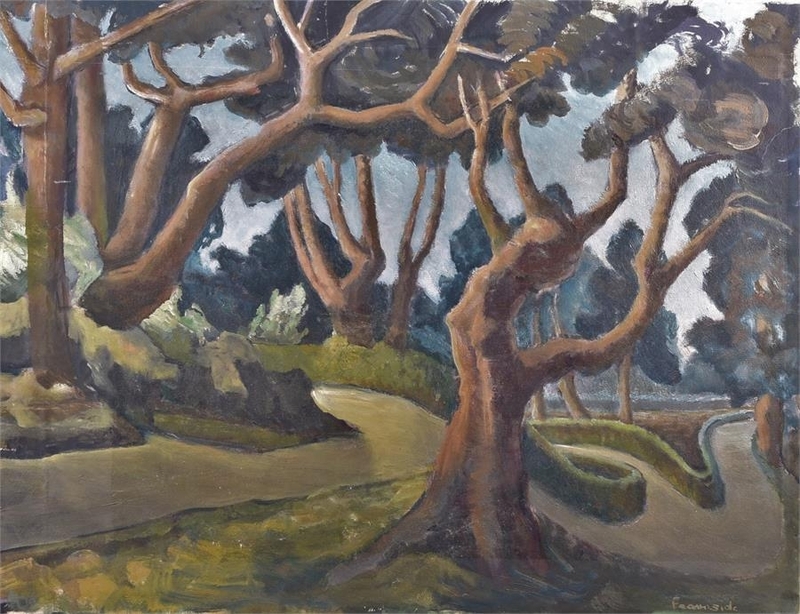 “Bushy Park” oil on board (11″ x 22″), sold at Morgan O’Driscoll’s – 25/6/2018 for €320.00. 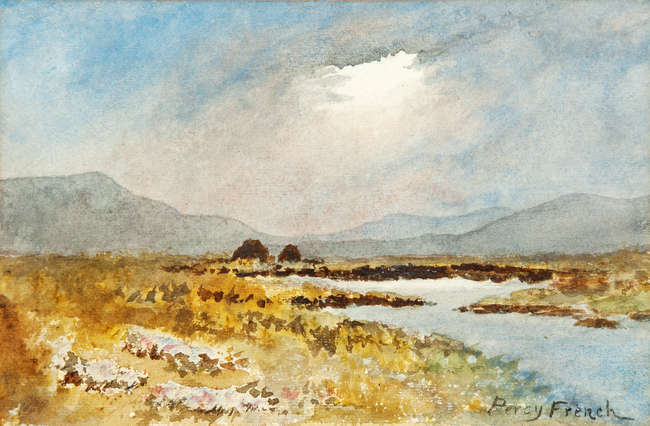 Left to right: “Evening Light, Connemara” watercolour (8″ x 12″), sold for €2,300.00; “Break in the Clouds” watercolour (8″ x 12″), sold at James Adams – 1/6/2016 for €2,600; and “Bog river, County Roscommon” watercolour (7″ x 9″), sold at Whyte’s – 28/11/2016 for €3,600.00. 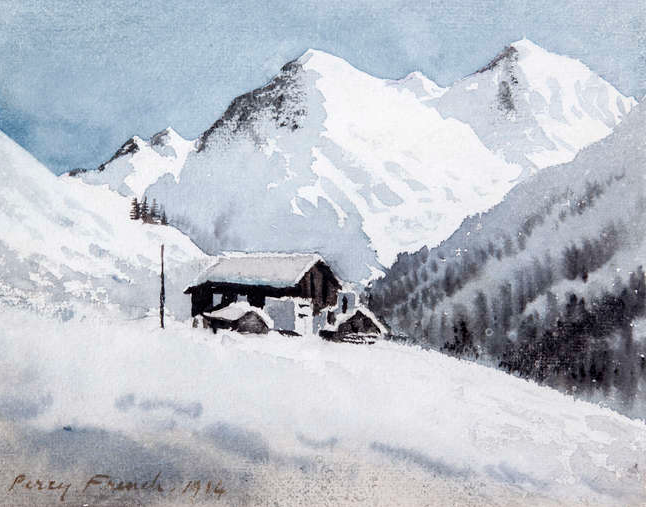 “Near Klosters” watercolour (7.5″ x 9.5″), sold at Adam’s – 28/9/2016 for €2,200.00. 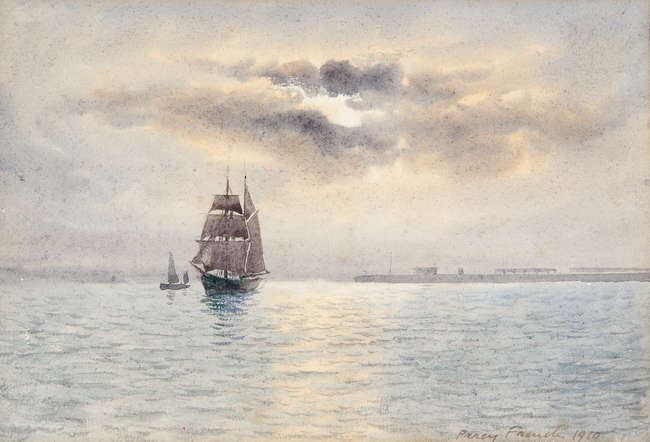 “Sailing Ship off the Coast” dated 1910, watercolour (6¾” x 9¾”), sold at Adam’s – 7/12/2016 for €3,400.00. 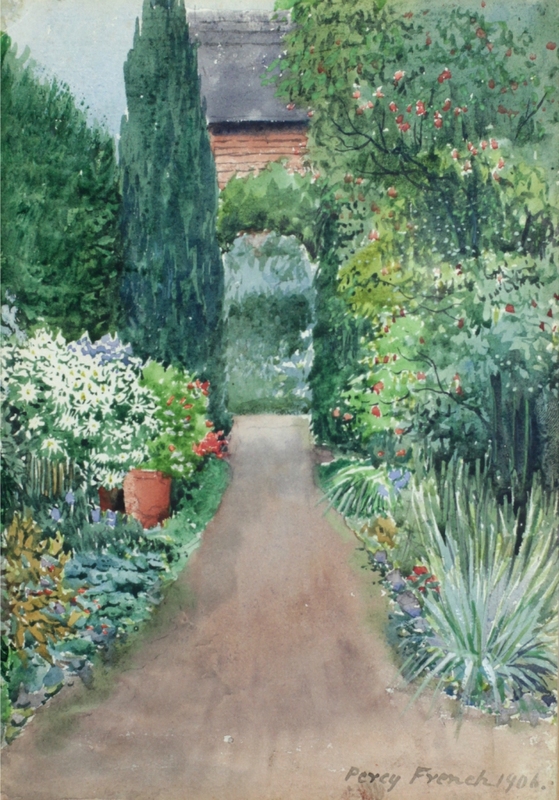 Left to right: “The Garden Path” dated 1906, watercolour (10″ x 7″); and “Bundoran” watercolour (7″ x 9.5″), sold at Fonsie Mealy’s – 8/3/2017 for €3,900.00 and €4,000.00 respectively. 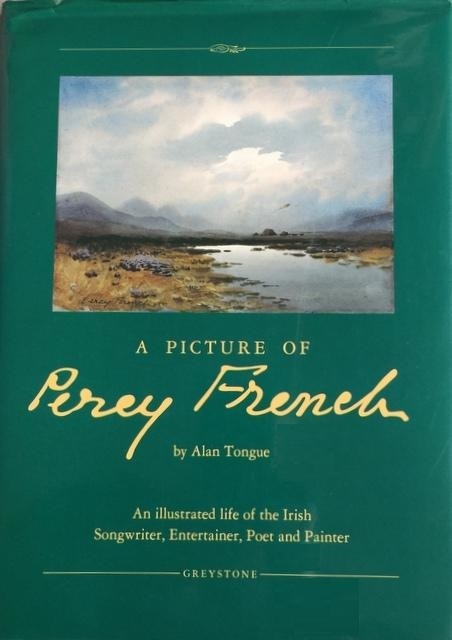 “A Picture of Percy French, An illustrated life of the Irish Songwriter, Entertainer, Poet and Painter” by Alan Tongue. Pub. Greystone Books, Antrim, (1991). Large format book, 99 pages, with over 200 illustrations. Many of them almost as large as the original paintings. 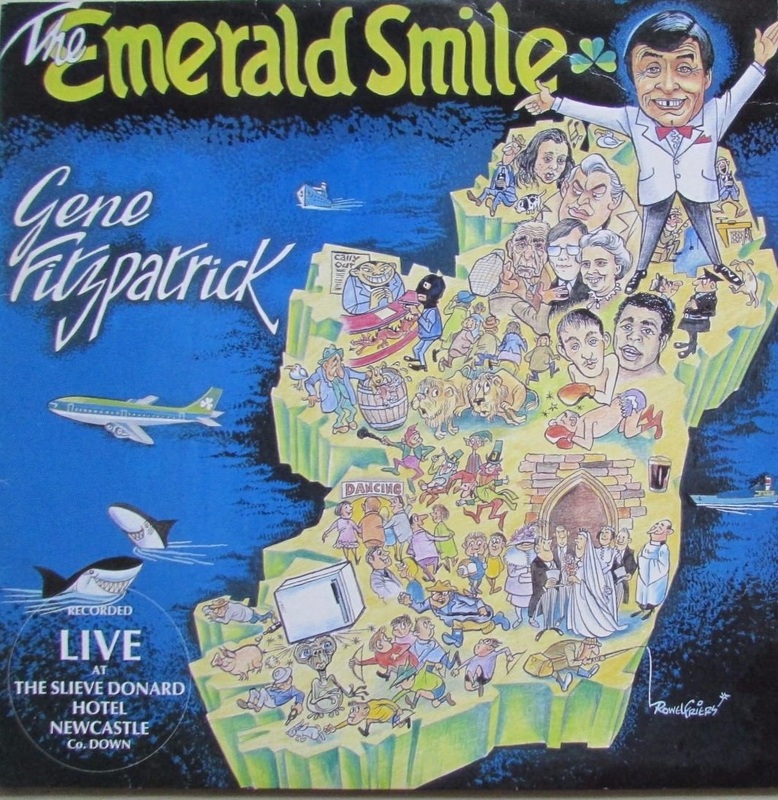 Born in County Roscommon in 1854, he became one of the foremost entertainers of his day, but every year after a busy London season, followed by a tour of Irish venues, he insisted on spending four weeks of perfect freedom in the west of Ireland, refreshing his memory of the scenes he loved. 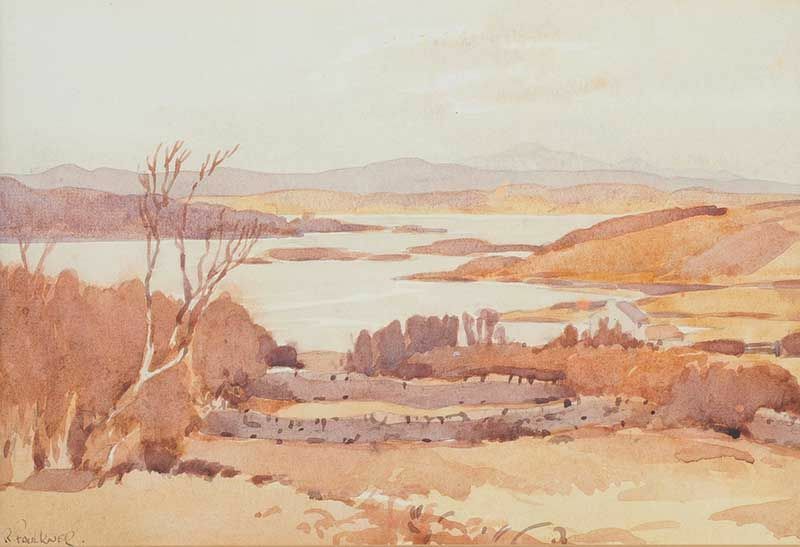 “Breaking Clouds above a Lake” dated 1906, watercolour (9.5″ x 12″), sold at Whyte’s – 28/5/2018 for €5,400. 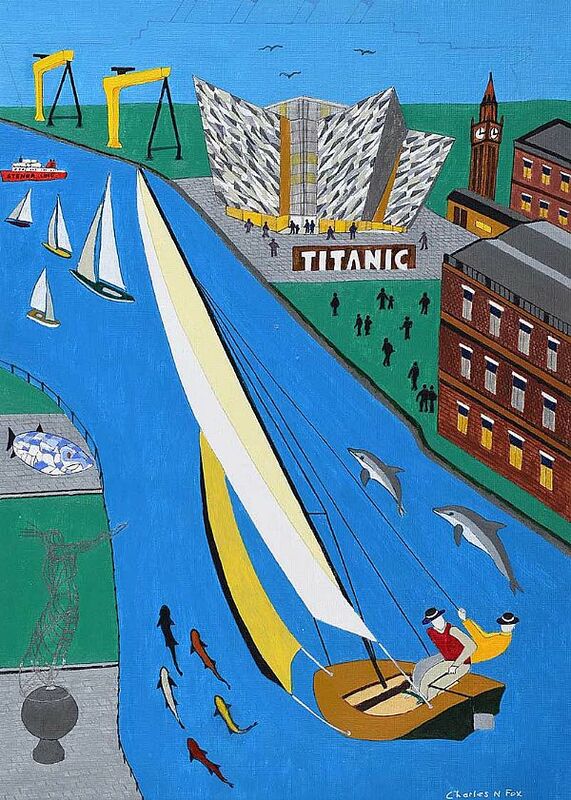 Belfast born cartoonist, illustrator, painter and lithographer. 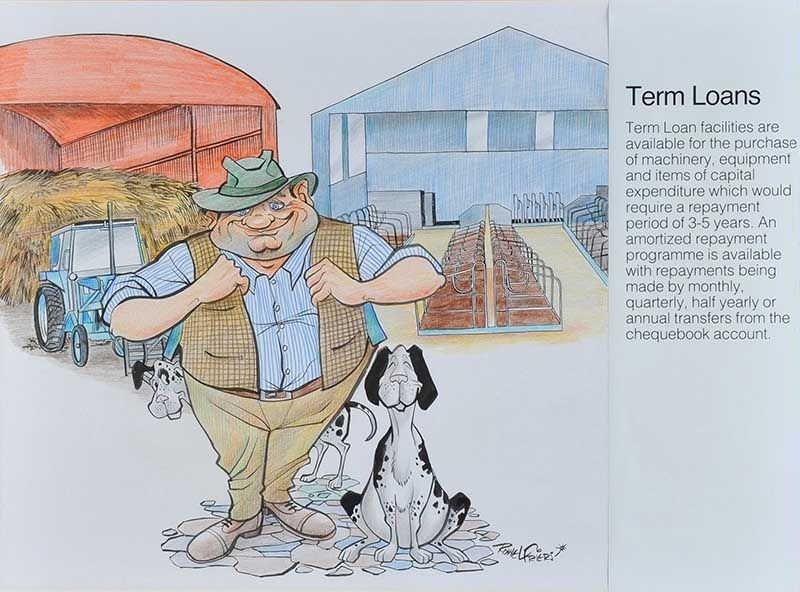 “Term Loans” watercolour drawing (17″ x 17″), sold at Ross’s – 29/3/2017 for £90.00. Left to right: “Study of an Eagle” mixed media (19″ x 12″), sold at Ross’s – 20/6/2018 for £90.00; and a vinyl LP cover from 1984. 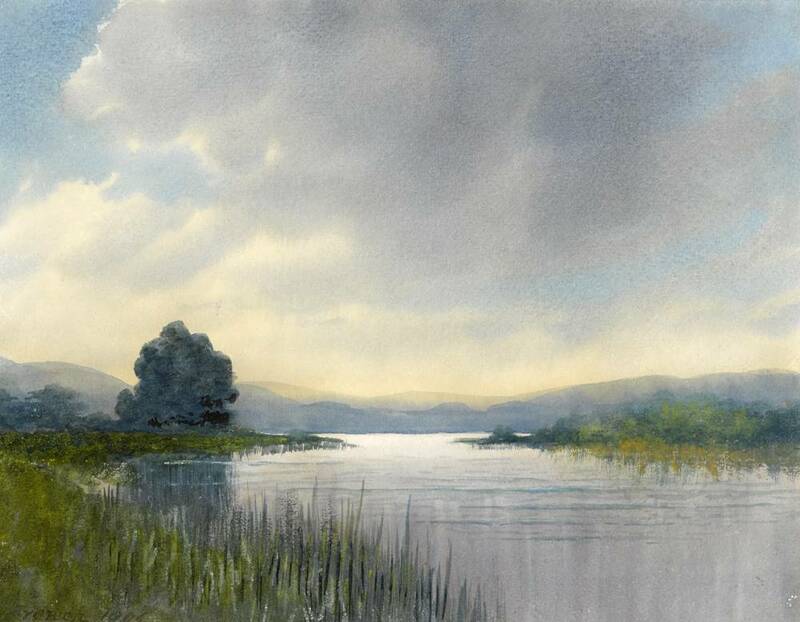 “Glendalough” watercolour drawing (14″ x 19″), unsold at Ross’s – 8/11/2017. 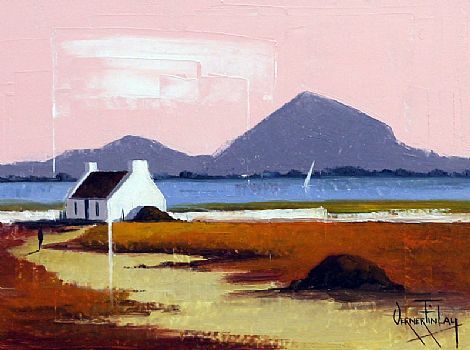 A Belfast born designer and painter. He was educated at the Irish Society Schools in Derry before entering the Government School of Art in Belfast in 1896. 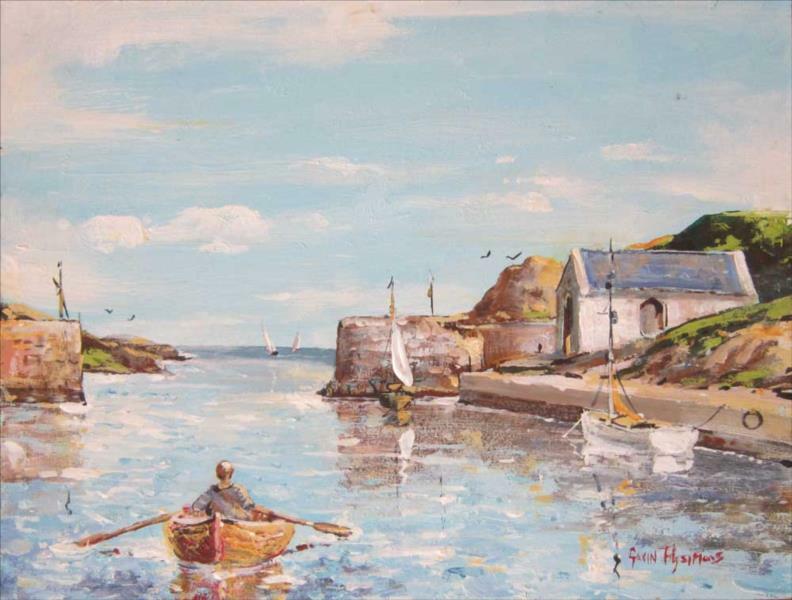 A native of Gorey, Co. Wexford, Paul Funge studied at the National College of Art & Design under Sean Keating, Maurice McGonigal and John Kelly. Later he was a founder of the Project Arts Centre in Dublin and the Gorey Arts Centre in 1970. 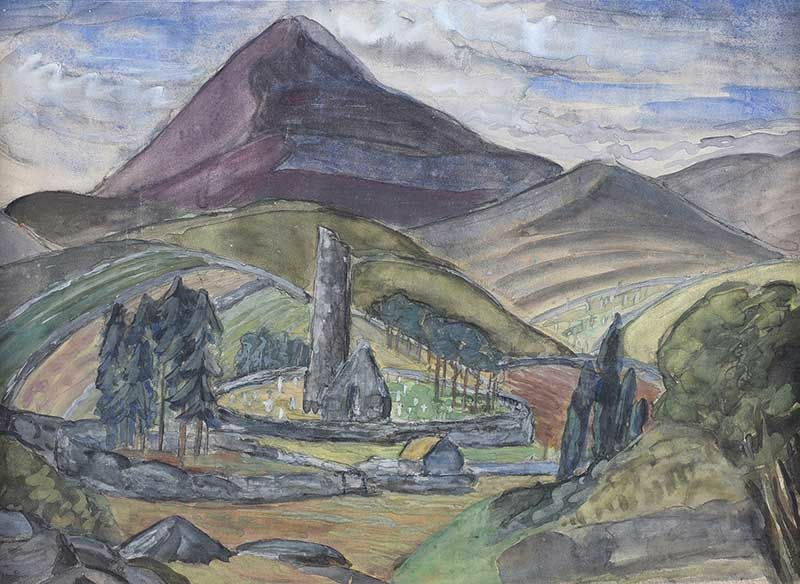 He was also a founder of the Belltable Arts Centre in Limerick while the regional arts officer for the mid-west. In addition, he established the Gorey Arts Festival – a three-week summer arts festival – and ran it for more than 15 years. 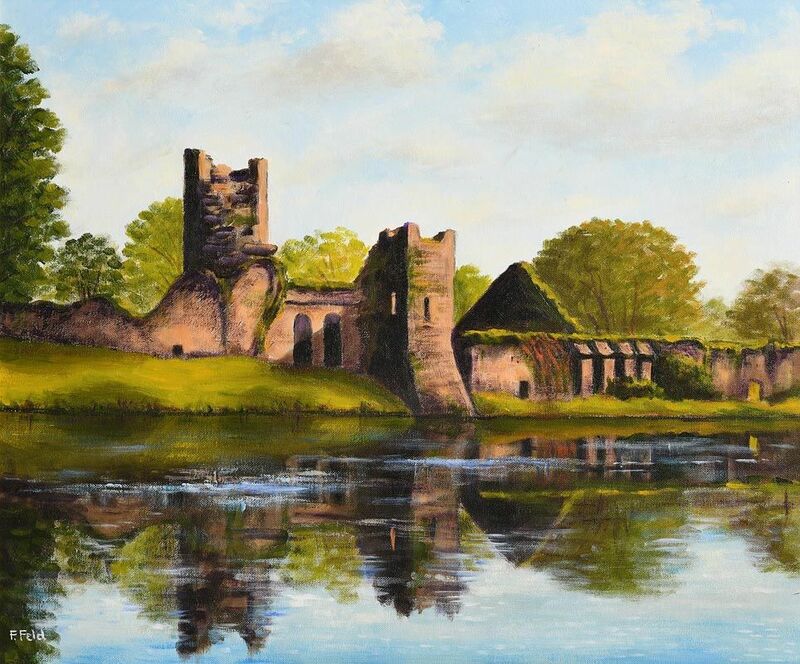 A painter of portraits and landscapes, he taught art in many schools including Clongowes Wood College and Newbridge College. 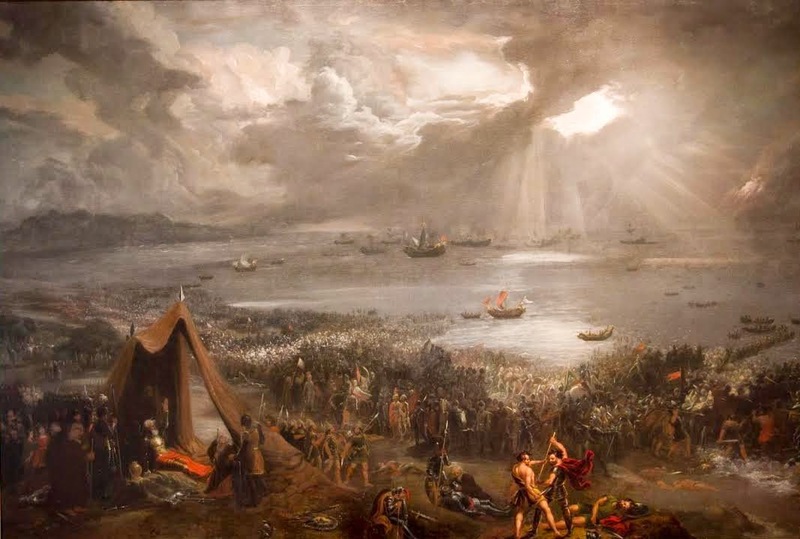 He also lectured at the National College of Art and Design (NCAD), the University of California, and Kunsthistorisch Instituut in Amsterdam. 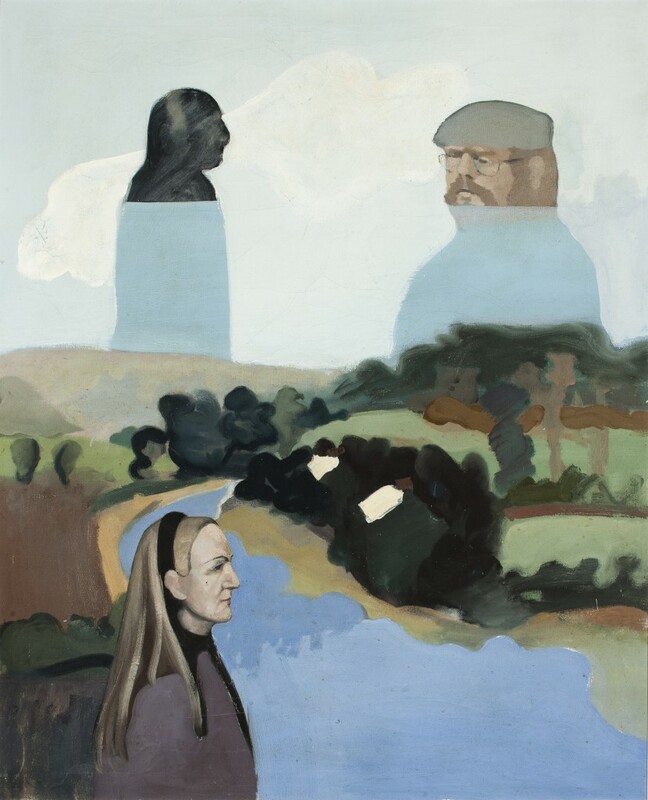 “Large Landscape with Figure” oil on canvas (47″ x 38″) – Wexford Co.Council Art Collection. 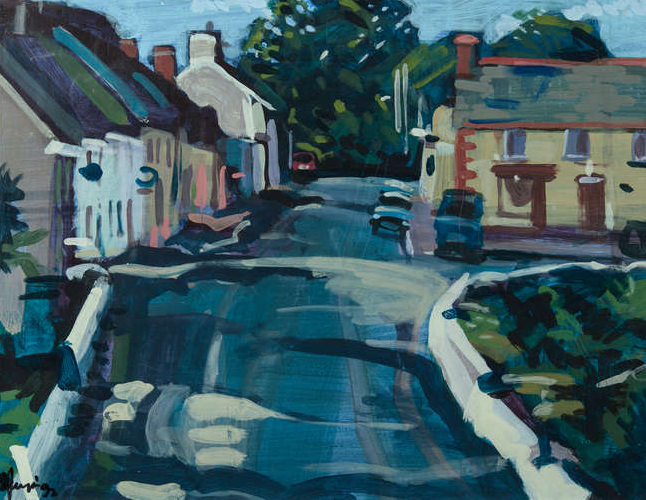 “Enniscorthy Street Scene” oil on board (19″ x 23.5″), sold at Adams – 20/9/2015 for €300.00.